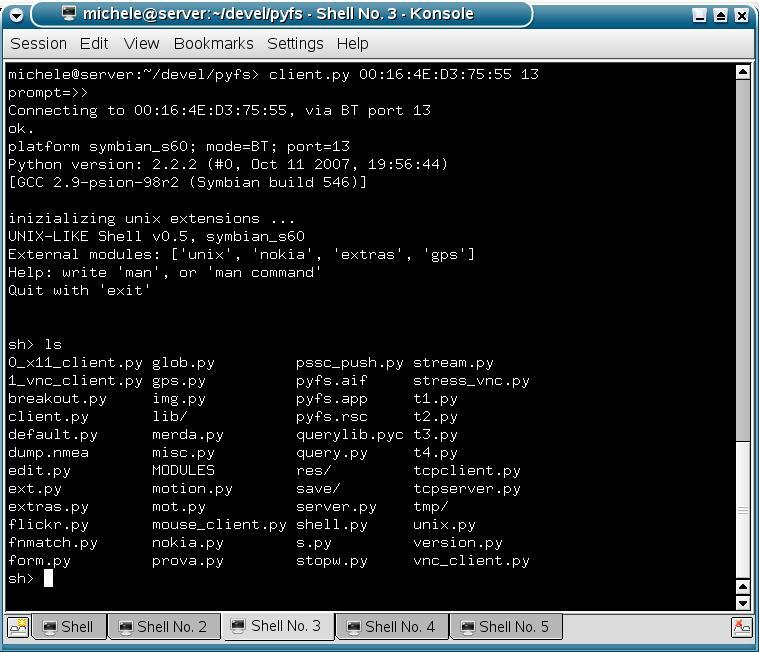 PyFS is a multi-platform client/server suite for Python, that extends the Python shell with typical UNIX commands like cp, rm, ls, mkdir,vi etc, and much others, such file-transfer commands (rx/tx), local and remote editors, webcam, motion-detection experiments, GPS tracking, etc. I used pyfs intensively as developing-platform when writing code for my Nokia phone (you can find some other projects of mine here: mulinux.sunsite.dk/python). PyFS currently works on this hardware: Linux PC, Windows PC, Symbian 2nd Phones and (NEW) Symbian 3nd Phones. PyFS is based on my stream.py multi-platform socket extension. Being my english considerably fractured, this flash video should be better then any FAQ. I tested the software using a Nokia N70 (symbian 2nd FP3), Nokia n95 (symbian 3nd), with Python 1.4.1-final, Linux OpenSuse 10.2 and a Windows-XP laptop. Installation istructions for Windows users. If someone can help porting the client-part on MAC os, I can support him. Basically, the suite is composed by a server part (called server.py) running on the phone, and a client part (called client.py) running on the PC, plus a pletora of python modules (stream.py, unix.py, shell.py, nokia.py, etc) that should be present both in the phone and in the PC. A this point, you will have in B a (remote) shell prompt, and everthing will works like s telnet ot ssh session. NB: in this example, 10 is the tcp port. You can change it as you like. Outdate (but more extensive) documentations here. To be REMOVED.